Summary: Even without shockers like we’ve had in previous weeks, the balance of plot movement, thematic relevance and character development not only brings us things we’ve been both expecting and yearning for, but makes this the most solid episode of the season thus far. Peter uses his new Observer vision to predict the Observers’ movements, and calls Anil telling him he needs his help. When Peter returns to the lab, Olivia notes that he hasn’t been sleeping. After de-ambering a tape, the team find instructions to use William Bell’s hand (which Walter removed in “Letters of Transit” to get Observer beacon cylinders (like from season 1’s “The Arrival”) that Bell had in storage. They discuss how Bell was with them, but betrayed them to the Observers, prompting them all to amber each other. They arrive to the facility, where Peter uses his Observer vision to find a door, which causes his ears to bleed. He says he’s fine, and receives a call from Anil, who tells him he wasn’t able to switch the briefcase of an Observer like Peter asked. 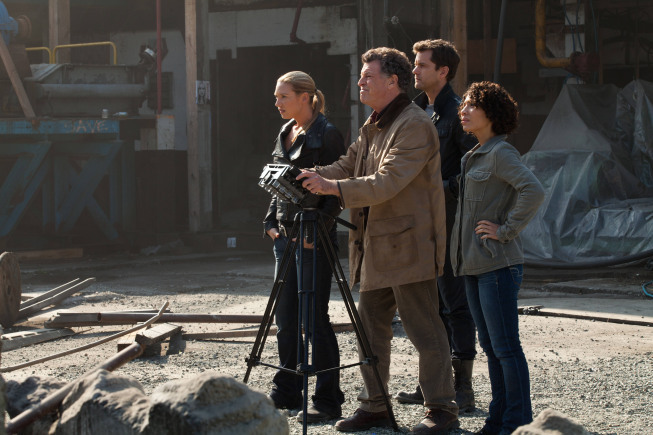 Walter, Olivia and Astrid realize they can’t get through the rubble, and decide to consult Nina Sharp for help, while Peter goes to meet Anil (without telling the group why he’s going.) After a tearful reunion, Nina gives the group a device that can change the atmosphere and turn the rubble into gas. Walter confides in Nina, that he worries about becoming the evil Walter he once was. Nina warns him that, even though he has Peter, Bell loved her and yet still managed to become megalomaniacal. Walter, however, thinks Bell became villainous because didn’t actually love anyone. Peter meets with Anil and reveals that he could predict when each Observer would do what. He realizes there was a variable he didn’t calculate, and decides to switch the briefcases on his own by following an Observer to the restaurant. The Observers eventually bring it back to their headquarters, and when they open it, it releases the toxin that killed Flight 627 from the pilot episode. The team makes it into the facility, where Walter uses Bell’s hand to enter. They find a safe, and after racking his brain, Walter gets into it. They find a device that releases the beacons from the ground, as well as a photo of Nina. They escape thanks to Peter’s distraction, unbeknownst to them. 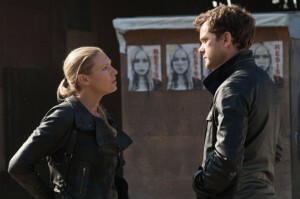 However, Olivia realizes that something is off with Peter. Walter gives the photo to Nina and apologizes. Realizing that Bell truly loved her and it still wasn’t enough, he pleads with her to remove the pieces of his brain. Meanwhile, Olivia finds Peter at Etta’s house. He has been keeping extreme track of the Observers, and he finally tells her the truth—he has their tech in his head, he can predict everything they’re going to do, and he is going to get revenge on Windmark. Olivia, disgusted by what Peter has done, leaves; Peter realizes his hair is falling out. Despite last week’s major pacing slip-up, this overall season has done a marvelous job of unfolding a serialized story at an appropriate pace. Every episode provides a necessary detail or event to keep the plot relevant and moving, and perhaps aside from “The Recordist,” there’s a bomb dropped or major development for every episode. It’s incredibly apparent this week how adept the storytelling has been, as we get an installment that’s about as perfect as it can get. Does that make it the best episode? Well, no; it doesn’t really provide anything new, and it’s admittedly a bit predictable. But it’s predictable for all the right reasons, and it’s still a nearly perfect episode in terms of structure. Walter’s fear of losing himself juxtaposed with Peter actively losing himself; Olivia’s struggle to figure out what’s up with Peter; a steady progression of the Observer plan; plus a satisfying Nina return all tie together realistically and thematically in more than one way. And even with very little action, the tension and stakes for our characters on an internal level is just as engaging as a gunfight, if not moreso. The “humanity” theme and parallels between Walter and Peter had already been established previously, but “Five-Twenty-Ten” amps up their importance to the show as a whole, and even ties them to William Bell. Bottom line: going full-on mad scientist for what you think is a good cause (saving your son; avenging your daughter) at the cost of your humanity might do exactly what you want, but it’ll sacrifice your loved ones and ruin your life in the process. Joshua Jackson pulls off the Observer-fied mechanical movements very well. It actually makes it more apparent that Michael Cerveris played “good” Observer September a little more fluid and softer, even with the mechanical movements. Peter’s head movements have a more jerky and sinister feel to them, and the scene in which he reveals his plan to Olivia is creepy because of it. It’s interesting that he was still able to carry himself normally when he wasn’t forcibly using the tech, until he goes full-on Observer when Olivia learns the truth. The moment he loses his hair is downright chilling. 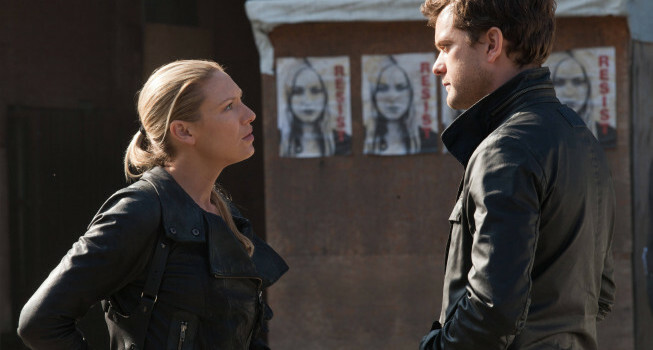 This is about the third week in a row where Olivia hasn’t been given much to do, but Anna Torv still manages to throw in very subtle- but-telling glances and ticks (I loved the way she briefly scratches her face between worrying about Peter and trying to focus on the mission, for example.) It was especially nice to see her open up to Astrid, something that’s not done nearly enough. And to finally see her fed up with Peter’s crap was a breath of fresh air. Things obviously aren’t going to be easy for them, but now that the truth is out in the open, Olivia can be confident enough to take charge and hopefully slap Peter upside his head for being such a doofus. Singing John Noble’s praises probably sounds like a broken record now, but he really was phenomenal this week. From the comical moment when he finds the David Bowie record, to the dramatic moment when he listens to that record (nice way twist a Walter-joke and make it extremely emotional, by the way) Noble turned it up. The brief flashes of old Walter do, like Nina said, feel like a different character completely, and Noble can switch his body language to exude that cruel confidence at the drop of a hat. While it’s still a little irritating that it took six episodes to bring up Walter’s reintegrated brain, the questions about it are in full-force here. Seeing Nina back was a pure joy. Nina is probably second only to Astrid as the show’s most unfortunately underused characters. It’s a shame, because Blair Brown gives Nina such a unique voice with her delivery. It’s wonderful, then, that she was given so much relevance in her return episode (more than Broyles’ kind of lackluster return.) Even with a full head of gray hair and electric wheelchair, she’s still got an edge to her. Her relationship with Bell had been alluded to in both timelines since season one, but from what I recall it was always a “maybe/probably/doesn’t matter” kind of thing until now. It ropes Bell back into the storyline, and even though I wasn’t a fan of turning Bell from a noble hero to a villain after the timeline shift, it does create an ample parallel that I simply didn’t predict. Creating that parallel between Peter/Walter, Nina/Bell and currently Olivia/Peter about a loved one failing to tether the megalomania is a stroke of brilliance. Admittedly, having Walter and Nina talk in such concrete terms about a parallel we could make ourselves is kind of heavy-handed, but Brown has always made the most unbelievable dialogue sound natural to the Fringe universe, so having it come from Nina worked in the episode’s favor. Also, production-wise, Brown’s make-up is much less distracting than Lance Reddick’s somewhat-overdone make-up. We also got to see the show return to its classic gross-out factor, albeit briefly, with the Observer’s jaw falling off just like in the Pilot. That, coupled with the exceptional David Bowie-scored end montage, provided the final strokes to make this episode fantastic. The show has to do a bit of walking on eggshells from now on, since there’s not much time to fix anything that goes wrong, but that’s clearly not stopping it from being daring. The main “get to the cylinders plot is simple-but-relevant, the overarching threads are moving along appropriately, and it’s continually tying into the show’s overall themes and playing up very important (and reflective) character development. The artfulness Fringe has managed to retain (and even amplify) despite going full-on sci-fi action is what’s made this show so strong for the past five years, and it’s good to see it on the road to going out with that depth. Why did the woman the Observer bumped into on the street and the coat check girl both look like they were pulled straight out of Mad Men? The heavy ties to season one are brilliant. After a lone commenter made me realize how little I retained from the show’s pre-alternate universe era last week, I’ve started going back and watching the early episodes. I’m glad I did—the beacons from way back in episode 5, “The Arrival” (a very good one, by the way) made more of an impact, especially considering that was the first major introduction to the Observers. The awkward talk between Walter and Bell when Bell is inevitably awakened from the amber without a hand will be hilarious. Also, Leonard Nimoy with an Observer pulse gun in place of that hand, anyone? On that note, it seems less likely that we’ll get an extended flashback of 2015 now, considering how much William Bell plays into the storyline. Even if they managed to wrangle Nimoy for long enough to do a full flashback episode, they’ve already pretty much described everything important, so visualizing it would just be redundant at this point.